Or at least pink is my June. I would say that I have made record-breaking purchases in the pink color array recently, but really I have only ventured into a certain shade. (I have always been strongly attracted to Schiaparelli's pink: shocking pink (known to the lay-person as fuchsia), since I worked for a designer at the Utah Shakespeare Festival who designed fabulous things in Le Shocking Pink). But I digress. Of late all of my sewing projects have been pink (if you hadn't noticed in Kimono-Sleeved Shirt), so it feels as though June really has been paletted in pink. (But don't worry if they offend your eyes, there are many other new and beguiling projects in the works.) So, here are the last two I completed recently. Remember my lovely pink lace on pink cotton fabric? I did make it into this ruffled skirt, and I think it turned out quite fetchingly. I tried to proportion the fabric so that the ruffles at the top were about 1.5 lengths to the length of the top yoke, so 1.5:1, and at the bottom the ruffle/skirt ratio is about 2:1. I am finally starting to maybe master those proportional concepts. I also love the double elastic waistband, so I make an effort to use that style on my skirts and pants. I find it distributes the gathering more evenly (this is also why one of the gathering techniques that you may learn is to sew two very long threads along the top of a ruffle or skirt to gather it. It tends to even it out.) The one thing I would change about this project if I did it again is that I would have made the lace ruffle just a little more full. pink. I have a pattern that I have made for her based on a favorite (and very basic) nightgown off of which I pattern variations of every estimable kind. Around Christmas time I made up about three nightgowns off of it and more recently I have been working on dress variations. For this particular piece I suggested a ruffle detail on the front similar to one of my sister's shirts involving ruffles of the circular kind. This took me rather awhile to pattern, as I had to recut some ruffles to get the right fullness. I also sewed one on in the wrong place too. (Whoops. That's why it seemed too short.) But I got it all figured out and together the night before I started my new job. Nothing like getting a project out of the way. It even turned out so well that my mom exclaimed she would have to wear it to a wedding reception or some fancy occasion. I love to see her do that little "I love it, and I am so pretty!" dance. Totally. Worth. The. Time. And last, but certainly not least, I will also confide to you that when I first heard this song, I was obsessed. It may have driven my new appreciation of Le Shocking as well. the right way? Also, I thought it could present an interesting sort of print for this season of mixed prints. (I don't know if the whole mixed prints thing is becoming big because it has been so popular on Project Runway, or if it started before then, but I'm on the bandwagon.) I also had a skirt my sis had given me, oh, maybe four years ago or so, that I have never worn 'cause I needed something to wear with it. me doing some creative cutting—as in I totally pieced the back. I used to pride myself on piecing. Yah, whatever. It's way too much work! orthwhile. And, wah, lah: (notice the diagonal stripe on the shirt, which indicates it's on the bias. Also the shirt tapers at the bottom to fit not too snug, but nicely around the hips.) Of course, it looks much, much better with the ensemble as a whole. And that was my fabu look for graduation. I can't even tell you how drama-fied it was. I will start first, however, with notes about the vest I was making for dapper Misha to wear to the opera. If you will recall, we had picked out the fabric, two prints actually, and I was ready to do the first fitting. The vest fit perfectly, and Misha and I were both quite pleased with how it was shaping up. I took special care to cut the collar and welt pockets with that nice pinstripe at a diagonal. Notice also that I lined up the center front lines (which I had marked quickly with a pink thread hand-sewn along the center front line) and pinned the vest there to ascertain the exact fit. Next up came the welt pockets. I was so excited to make such a gorgeous vest with functional welt pockets that I commented to my sister that I had never made a one before. 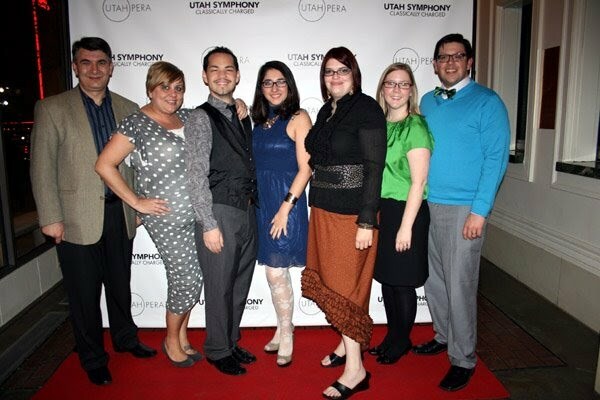 Then I realized what a dumb statement that was, since I have made literally hundreds of vests in my work at Utah Opera (USUO); I have just never made one out of my own studio. I did experience a few trying moments of "OMG! How come when Mili cuts that, it's so much better!" (Mili is the tailor I worked for at USUO.) I did manage though, somehow, to come out with a decent product. I also grommetted (can grommet be a verb do you think? I certainly use it as such) the back fastners so they would have a lace-up effect rather than using the traditional buckle (the lace-up back on a vest is more period than current fashion, and I think way more posh looking). The grommetting process is always fun, but a bit nerve-wracking since you want the grommets to set properly and not pop out at a random moment. There is also a real science to pressing the fabric also after you have sewn in the welt pockets or the lining or added grommets. It's a sort of steam and pull approach in order to get the seams to relax a little and lay exactly how you want them to. Alas, this fabric was a bit more difficult to work with than I had expected, but still turned out pretty beautifully (I thought). And finally, the events leading up to the actual evening were pretty crazy. They involved a deflated me due to dress trauma, a damaged tire (seeing Mindi standing in the Firestone lobby in her sky-hi shoes and formal dress getting a new tire was somewhat memorable), glacial service at our pre-performance dinner, and rather haphazard parking arrangements due to extreme lateness. We did manage, however, to take our own photos on the red carpet (we were too late to join the official photo-shoot line) in the two minutes before we rushed to our seats in the opera house. And the opera was a bit of a tear jerker, so I was really glad my mascara seemed to be waterproof. Nothing really went as planned (and this has been a month in the planning), but, it was certainly an evening to remember. Also, I'm not sure if you recall, but I had hoped to make my own dress to wear that evening. Alas, when it still wasn't coming together after 30 hours of work up to the day before the evening out, I decided to call it quits. (Hence the "deflated me" statement above.) I think I can still pull this dress together somewhat, but I need to do a few more alterations: re-cut the sleeves, fix the hem, and buy the right accessories. This photo of it gives you a little idea. I am going for a very vintage feel with a slip underneath involving ruffled netting and a hem that stands out via horsehair. But making a dress for myself is ever-so-much harder than making something for other peeps! Fitting, in particular, is a challenge. So, there were some successes for this occasion and a wee failure, but you must pick your battles. Right? We still managed to look fairly good and have an interesting evening. After all, there is always next season to begin planning for!